Anyone who has been training for any period of time knows one of the greatest challenges of being a coach is helping people where their goals seem impossible to combine. Specifically, the fact that most people want to get in shape, but typically they are battling injuries and movement dysfunctions at the same time. A classic issue is how do we build metabolic exercise techniques with also corrective exercise? You might be surprised how thrusters could be the answer. Using thrusters (squat and press) to build metabolic work makes sense, but using thrusters would seem OPPOSITE to most people to give to people with problematic shoulders would use. However, performed with the right intent, you will find this quickly becomes not JUST a metabolic exercise, but a drill that teaches you a heck of a lot about WHY achy shoulders shouldn’t keep you from training hard! Thrusters are an exercise that has been around forever, that we can probably thank Crossfit in popularizing. 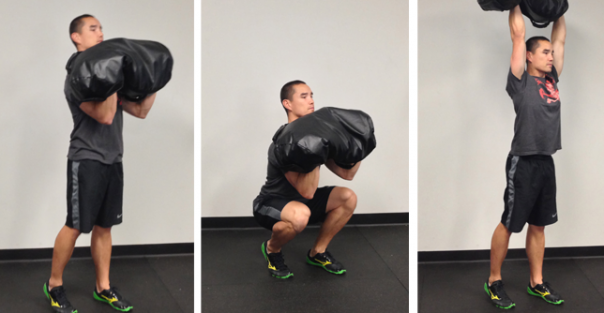 The squat and press movement is a full body exercise that definitely trains everything from head to toe. We are going to show you how thrusters can be far more than maybe you ever thought! The more familiar barbell version can be problematic for people with chronic shoulder issues. That is largely due to the fact that a lot of shoulder issues occur when the arm externally rotates (so you arms are turned outwards). Part of the issue has to do with the structure of the shoulder where the head of the humerus can get impinged, another is the issue that it is much more difficult to use the lats to help stabilize the shoulder, and the last is you require more mobility through the shoulders and t-spine to get the arms overhead in this position (something that most people simply do not possess). An answer to this tremendous metabolic exercise really comes in two benefits that DVRT Ultimate Sandbag Training provides. The most obvious is the neutral grip that we take when we are pressing the Ultimate Sandbag. This position is far more forgiving upon the shoulder and usually allows most people that have issues going overhead feel far more comfortable. You might think this is not really unique to the Ultimate Sandbag because we could do the same position with dumbbells and now even some people are using landmine attachments. So, why would this be unique and more beneficial than these other methods. It actually starts with one of the biggest reasons people say the use Ultimate Sandbags in the first place, which is instability. 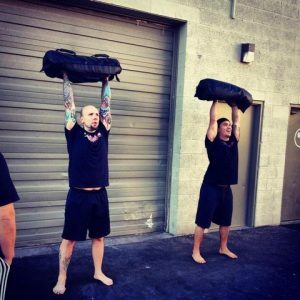 Anyone that has pressed an Ultimate Sandbag realizes just how much of a metabolic exercise this is in the first place because the instability of the Ultimate Sandbag requires the entire body to be engaged at its highest level. 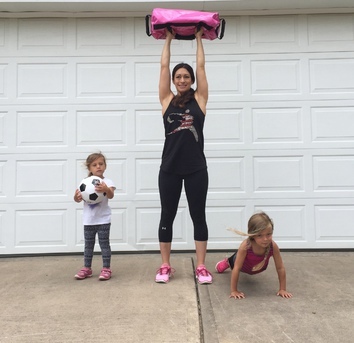 Having less than ideal form (no matter how strong you are) will cause the instability of the Ultimate Sandbag to overpower you and simply you won’t be able to hit the lift! So, what makes our DVRT Ultimate Sandbag Training thrusters such a great example of how to combine metabolic exercise with corrective movement is that you need to know how to use the entire body from head to toe correctly in order to press well. If you don’t create proper tension in the hands, if you don’t engage the lats, if you don’t brace the core, if you don’t drive from the feet, you will NOT hit the lift! The last attribute that makes the metabolic exercise of the thruster such a great drill for building more sophisticated strength is the philosophy of our DVRT program. While most people see the thruster in one or two different ways, focusing more on load, reps, and speed, DVRT takes a different perspective in building more sophisticated movement strength. In the video above, you will see how we manipulate body position, plane of motion, and where/when we press to help teach correct connection of the body. Using these combinations requires the proper tension and stability to nail each repetition. When you do introduce speed, that only makes the need for quality movement at a higher level. That is why speed is typically the FINAL element we introduce because it brings in another element of instability to this great metabolic exercise. Hopefully what you are seeing is that getting in great shape and teaching your body how to be healthier don’t have to be contradictory ideas. Having variety is simply looking at good movement concepts and manipulating upon strong principles to get unique exercises that are simply layered upon one another. THAT is truly the power of our DVRT Ultimate Sandbag Training system.